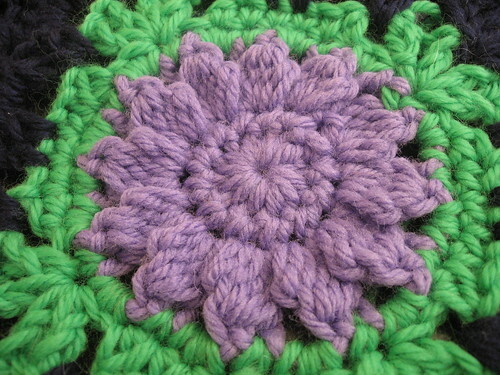 This is the center of a granny square I did recently for a ROAK on Crochetville. The pattern is the Multi Stitch Granny available free from Dayna’s Crochet. I really like her crochet square pattern selection. There are slightly altered grannys, pretty lacy squares and solid textured designs. Also, she has nice pictures of the samples. I’m not sure the purple flower petals were meant to overlap. 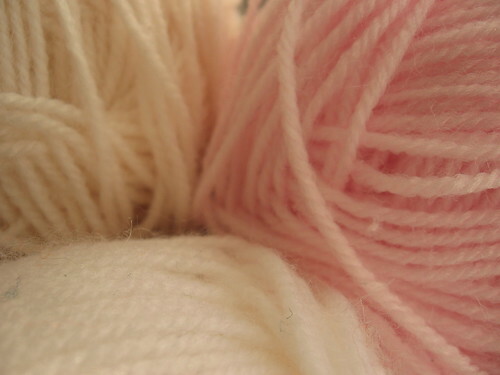 In the picture from Dayna’s Crochet site the petals are arranged next to each other but my flower won’t lay like that. I like the effect though. By overlapping the petals it adds an inconspicuous three dimensional texture. When you leave a comment on my blog for the PIF please leave your name on Crochetville, Craftster or Ravelry. If you prefer you can e-mail me at thekidneybean@gmail.com or just leave me some way to contact you. – Edit – One PIF spot left!